The Angry Birds case has been settled under confidential terms. Hagens Berman is extremely pleased with the result. A Seattle artist filed a lawsuit against Hartz Mountain Corporation – one of the nation’s largest producers of pet-related products – claiming the company illegally sold the artist’s trademarked Angry Birds pet toy line to video game giant Rovio Entertainment Ltd, robbing her of millions of dollars of royalty fees. The complaint, filed August 4, 2014, in the U.S. District Court for the Western District of Washington, claims that Hartz never purchased the intellectual property of the Angry Birds line of pet toys created by Juli Adams before it entered into a separate agreement with Rovio, makers of the wildly popular Angry Birds video game franchise. Adams, who studied art at Evergreen College in Washington state grew up creating art and worked to make a living painting, selling her works at art shows across the Pacific Northwest. At the beginning of her art career, the artist was showcasing her work at numerous art shows and upwards of 15 art fairs a year. It was at one of these art fairs where Hartz discovered her work. Years before the world knew Angry Birds, the video game, Hartz asked Adams to create a pet toy line, according to the complaint. She designed a pet toy line she dubbed “Angry Birds,” plush toys for cats, partially inspired by her own two felines. Adams said that as soon as her cats were left alone with the pet toy prototypes, they would immediately pull the feathers from the birds, adding to the roughed up look. Hartz entered into an exclusive agreement with Adams in November 2006 which stated that there was to be “no transfer of ownership” of the Angry Birds intellectual property from Adams to Hartz. The complaint states that the agreement gave the toy company only limited licensing rights and did not give Hartz the right to license Adams’ intellectual property to third parties for its own profit. Adams said that she believed this agreement with Hartz would help launch her career as an artist. After the launch of the popular Angry Birds video game in December 2009, Hartz used Adams’ intellectual property and the trademarked “Angry Birds” name to leverage a deal with video game creator, Rovio, the suit states. The complaint adds that Hartz violated the agreement without Adams’ knowledge and permission, and without ownership of her intellectual property or trademark. Adams was then dumped by Hartz, according to the complaint, while the toy company began issuing pet toys under the same Angry Birds name, during which time the agreement between the company and artist was still in effect. 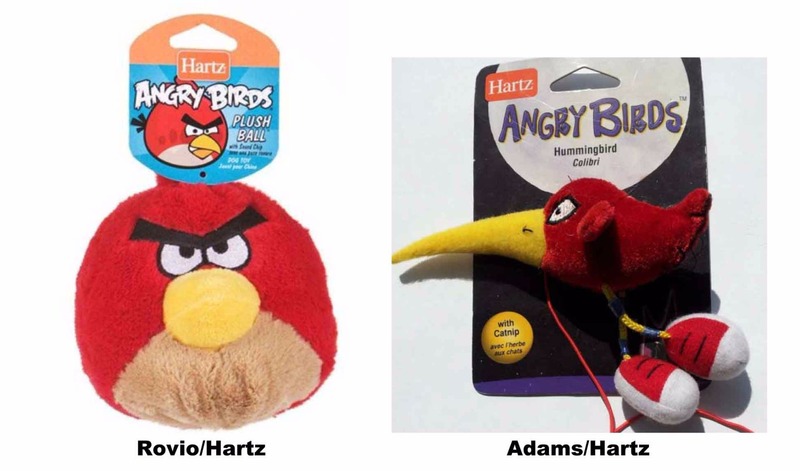 Hartz continues to sell the Angry Birds pet toy line without any legal property rights to the trademark or any approval from Adams, according to the complaint. The suit states that Hartz’s last royalty payment to Adams was in 2011 for $40.66. According to Adams, Hartz told her that she could no longer use the name “Angry Birds” due to a conflict. After the launching of the Angry Birds video game, Rovio sought trademarks in a variety of product arenas, including children’s toys, clothing and cell phone accessories. However, the suit alleges that Rovio’s trademarks specifically excluded toys for pets, because that trademark is and was registered to Hartz in 2007, after its agreement with Adams.